Another day, another birthday celebration for a United legend. This time it’s Johnny Giles, 75 today and famously one half of the best central midfield partnership of the last century. If Billy Bremner was the heart of Don Revie’s peerless team of stars, then surely John Giles was the brains and the vision, dictating and switching play, spraying passes all over the park with laser-guided accuracy and combining with Bremner in a way that many described as “telepathic”. Johnny Giles was recruited by the wily Don Revie from under the nose of the great Matt Busby at Man U. He had shown his quality there, despite never really being played in the position where he could best influence matters on the field. Even at Leeds, his transformation from good winger to great schemer came about almost by accident, injury to the existing midfield general Bobby Collins influencing Revie’s thinking. Man U’s loss though was most definitely Leeds United’s gain over more than a decade as they rose to the top. Don Revie referred to his capture of Giles from Man U for a mere £33,000 as “robbery with violence”. Busby called it simply “my greatest mistake”. Giles brought so much to Leeds United that it’s difficult to find the space to describe his impact. Put in on-field control of the play, he pulled strings and evolved strategy as each game progressed. His range of passing was legendary – TV commentators used to admire his latest pinpoint delivery by comparing it to the appropriate golf shot (that was the six iron). His ability on the ball, whether passing or shooting, was well-known and much admired; Gilesy was the acknowledged master. What was often overlooked by the uninitiated was his steely efficiency in looking after himself in the warlike atmosphere of combat at home and abroad. Peter Lorimer tells the story of how Giles inflicted summary justice on a Turkish player who had persistently fouled him in the away leg of a European tie, and was then daft enough to crow in his face at the final whistle. John was miffed, and advised the Turk that he would see him in a fortnight at Elland Road. This was no idle threat. Two weeks later, Giles asked Norman Hunter to drop the game’s first pass a couple of yards short – what is known as the “suicide ball” in football circles. Norman did as he was asked, the Turk eagerly jumped in to dispute possession – and Giles pounced, leaving his foot in to reduce his tormentor of the previous game to a grievously-injured heap, swiftly off on an urgent journey to the nearest hospital. After the game, there was some puzzlement over how promptly the ambulance had arrived to assist Giles’ victim. The Elland Road switchboard operative swore blind that Giles had booked it for him before kick-off, something Johnny always denies. But the message was stark: mess with Giles or any other Leeds player at your peril. They looked after themselves and each other, and the bond thus forged endures to this day. When Don Revie left for the England job, it was an open secret that he had nominated John Giles as his successor. The board were set fair to act on this recommendation, before backing down for fear, it is said, of upsetting Billy Bremner. It was an appointment that clearly should have been made, to ensure the kind of continuity Liverpool enjoyed after Bill Shankly stepped down. Who knows what the subsequent history of the club might have been? Giles had already had managerial experience with the Republic of Ireland and he went on to great success with the revival of West Bromwich Albion. In the event, he played on at Leeds for one more season under Brian Clough and then Jimmy Armfield. His last game for United should have crowned a glorious career with the top honour in club football. Sadly, thanks to the atrociously crooked display of referee Michel Kitabdjian for the 1975 European Cup Final in Paris, this was not to be. Johnny Giles went on to enjoy a successful career after Leeds United, both as a manager and later in the media, where his eloquence and vast knowledge of the game served him well and earned him enormous respect in his native Ireland and further afield. He has gone down in Leeds United history as one of the true legends of the club – a great among greats. In terms of value transfers for Leeds, he has to be the top capture, despite the rival claims of Bobby Collins, Lucas Radebe and Gordon Strachan. It was a thief’s bargain, possibly the buy of the century. Thanks for the memories, Johnny Giles, and a very happy birthday indeed. This entry was posted in Football, Leeds United and tagged Don Revie, Leeds United, Man Utd, Matt Busby. Bookmark the permalink. Great article. I have followed Leeds from before the appointment of Don Revie. You can trace the demise of this great club bar some fleeting success with Wilkinson who then went completely mental after winning the League to this one decision to backtrack on the appointment of Giles. We have never yet got over this single stupid mistake by the Board. Will BMcD be our next inspiration given time? He is putting everything in place and if we can now get on a run I still fancy us for automatic promotion! A new era dawns after 40 years of frustration? Now if Mowatt and Dawson can be the new Giles & Bremner we really would be back. I certainly like the optimism here! What a privilege it was to be a supporter in the Revie era. 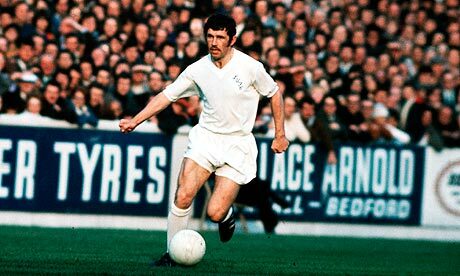 Johnny Giles could pass the ball and land it on a sixpence. Happy Birthday Johnny and thanks for the memories. Giles was THE reason I supported Leeds back in the day. And the style of play he crafted – chess-like possession football – is the style I will always associate with the club & ,hopefully, Penfold can bring it back! Only Paisley’s Liverpool were as effective at playing it in English club football since then. All else has been brainless “hoof, dribble, flick-on” stuff – even in the glorious EPL. Johnny, to quote Steely Dan, “You were Italian in their eyes”. I don’t like the way you glorify a blatant infliction of an injury on a opposition player…what kind of role model are you?……. “the suicide ball” , shame on you…. James doesn’t like it, folks. So, guess what? James is going to have to……… LUMP IIIIIIIT!!!! Have a nice day, James. You must have been some player then John at whatever level. Every team needs a Giles, but so few ever get one. We were truly blessed back then. Another fine article Rob – thank you. You have certainly been churning them out of late ! Livlng legend. The reason I developed a very unhealthy Leeds United addiction as a Dublin kid in the 70s. An addiction I will never shake. Thanks Johnny!!!! Was gutted when Brian C got the manager’s job in preference to Giles. Let’s hope our current Brian can get us back in the top flight. I think he will, given time. As a Baggies fan I have fond memories of his resurrection on the Albion. His style of football was a total contrast after the sacking of Don Howe. At 38 years old he was still our best player. I would loved to have seen his at his peak. He turned us into a mini Repulic of Ireland with Paddy Mulligan, Mick Martin and Ray Tracey. Happy birthday JG. Great memories. Not only one of the best midfield players of his time but one of the best of any time. Watching him was like a master class in how to play the game, the cool head to Billy’s heart, what a combination. Can’t forget either that he was the best penalty taker I’ve ever seen. Happy birthday great man. Great article Rob and spot on, as always. I can confirm that BB did indeed refuse to accept JG as manager as a team-mate of theirs told me over a beer several months ago. Billy was the boss of that dressing room and repeatedly told Cloughy to F off several times a week. Happy days!!! With the Revie team it wasn’t, would we win, it was by how many. JG was a top player in a great team. The only thing wrong was the number of trophies they won, should have been far more, they should have been out of sight. Put simply… A God, simple as. Great article yet again. “Great Player”to coin a favorite phrase of the man himself as a pundit. Indeed a player of skill and brains, what might have been , Indeed often people how close he came to getting Ireland to their first World Cup some time before big Jack took the reins.